Located in a 1920's factory building, the PFW furniture making school and workshop is both a teaching facility and a working shop. For wood working courses it features a hardwood floor, with both a bench area and areas for machine work and assembly. 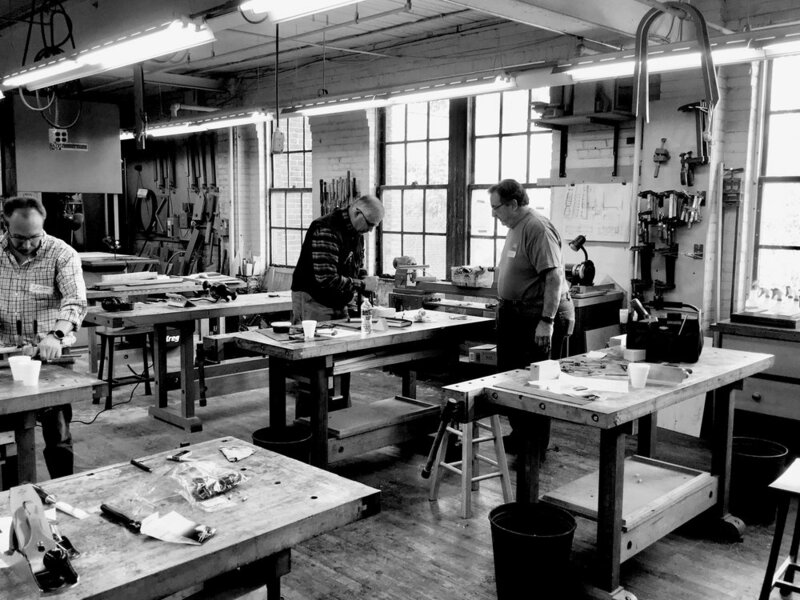 The bench area contains 12 traditional joiners workbenches. North windows across the front of the building provide abundant natural light. Mortisers, radial-arm drill press, edge and spindle sanders along with additional supporting machines, jigs and supplies that help students move smoothing through the learning and making process. PFW also has a full compliment of hand tools for student usage. If you are a new woodworker, the Beginner Courses and Learning Series are good places to start. If you have some experience, try our Projects Course listings. If you want to brush up on a skill or learn a new one, then click on the Tools and Techniques tab.